Learn new tools and techniques to help PreK-12 youth reduce stress and develop self-control, attention, fitness and social/emotional skills with Yoga Calm’s acclaimed Youth Instructor Certification program. Its unique integration of physical, mental and emotional skills-building supports both learning and health. And its focus on communication skills, emotional resiliency, mindfulness and positive behaviors brings back the joy of working with children. Our Youth Instructor Certification Program is well suited for a variety of people, including moms & dads; school teachers, nurses, counselors and school staff; mental health professionals in private practice or therapeutic communities; occupational and physical therapists; and yoga teachers. Creatively designed to support your personal and professional growth, our program gives you the training, practice and guidance to become successful in this exciting new way of supporting youth in school, at home and in therapeutic settings. And with both in-person and full online certification tracks, we can flexibly meet your needs. Apply your Youth Certification in-person training hours toward our Yoga Alliance RYT-200 Adult Instructor Certification Program, saving you time and money. Membership Program with free access to hundreds of lesson plans, online courses and over 50 training videos. Product discounts with Prana, Lululemon, Lucy, Gaiam, and other companies. Certification can be completed in as little as three to six months, with no completion deadline. Coursework consists of completing five courses and is based upon learning how to teach the 100+ activities from the award-winning Yoga Calm for Children curriculum. Courses can be taken online, in-person or in a combination of both. The quickest and least expensive route toward Certification is with our Online Certification Bundle. You can start immediately, work at your own pace and you will have lifetime access to all course materials after you certify. In addition, you can “retake” any online course in-person for $25-50. You can also take each course in the certification series online, one at a time. More information here. Or you can take courses in-person, one at a time. Want an in-person course experience and the opportunity to meet and collaborate with other professionals? Then in-person courses are the option for you. Portland in-person course contact hours can also apply toward our Adult (RYT-200) Yoga Teacher Certification Program which is held in Portland, Oregon. A third option is a mix and match of in-person and online courses. 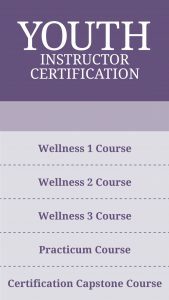 For example, you can take the Wellness 1-3 courses in-person at one of our Intensive trainings and then complete the rest of the certification series online, by taking the online Practicum and Capstone. This is a good option if you want an in-person course experience but live away from where our in-person courses are held. Our master course calendar has all available online and in-person courses listed for your convenience. No previous yoga experience is necessary to start your certification training, but a weekly practice is required for all certification candidates to help you embody what you teach. Need some help creating a course track for your unique needs? We love to hear about your vision for this work and how we can make our trainings fit your needs.email us or call 503/977-0944. Certification coursework qualifies for five graduate credits (depending on location and format) and 60 clock hours. CEUs are available, too, and a Certificate of Completion is provided with all courses. 60 Continuing education hours are also available for those that already have their Yoga Alliance RYT-200 registration. Contact us by email or call 503/977-0944 to help create a course track for your unique needs.